Users have access to the new Discover feature within our software to highlight what is new in each release. This allows administrators and users to to learn about new and improved features, enhancements, updates and more, with a single click. TechnologyOne University connects users with powerful learning and training resources. This maximises the software investment through self-paced learning and comprehensive training delivered from the cloud. Portals extend the scope of our enterprise system beyond the traditional boundaries of our customers’ businesses to include their customers, business partners and suppliers. Portals provide a simplified, out-of- the-box user experience tailored for each stakeholder group. 2016B focuses on the delivery of end-to-end business processes to suit the way our customers work on their day-to-day operations. This new functionality is packaged in two releases each year, complemented by timely delivery of minor updates. The 2016B release marks key changes to advance the smarter software delivery of TechnologyOne solutions. We are announcing three exciting new initiatives: Discovery, TechnologyOne University and Portals. 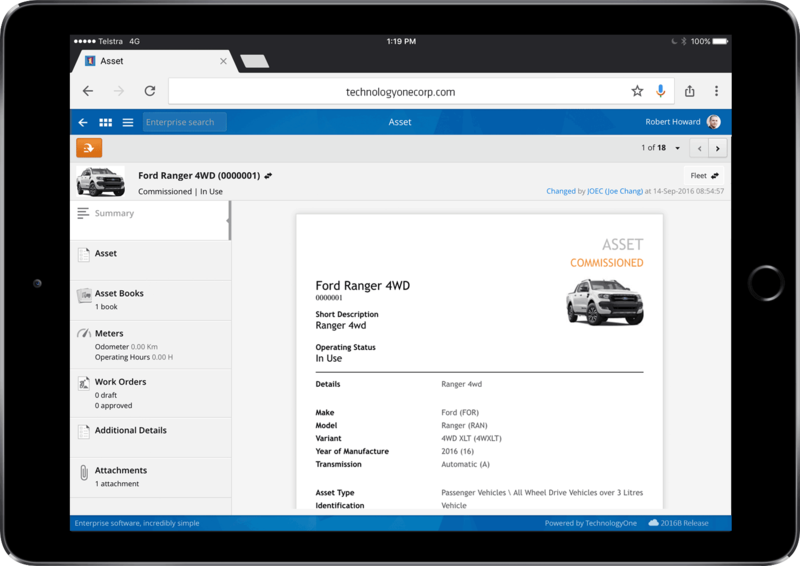 Discovery gives users a quick, simple view of what has changed in their software with each release. This is complemented by the TechnologyOne University, which connects users with powerful and timely training resources that can be accessed when they are needed – on any device, anywhere, any time. Portals extend the scope of our enterprise system to include our customers’ important external stakeholders: their customers, business partners and suppliers. 2016B also delivers a full suite of completed business processes available in our enterprise software solution (Ci Anywhere). The combination of the new Discover feature and TechnologyOne University provide instant access to what is new in the latest release, online help within the software, and easy access to simple learning resources that provide convenient support and a great customer experience. Our customers work to deliver business processes in their day-to-day operations – to facilitate efficiencies, we have aligned our software development to deliver end-to-end business processes. New releases will occur every six months. The next release is 2017A. Our Evolve TechnologyOne User Conference will further showcase how the 2016B release will prepare our customers for a cloud first, mobile first world.